Brazilian President Jair Bolsonaro met on Tuesday for an intimate conversation on his nation's future with more than a dozen Evangelical Christian leaders. The goal of the meeting was to discuss the upholding of traditional values, reported CBN. What was supposed to be a meeting, turned out to be a prayer meeting. 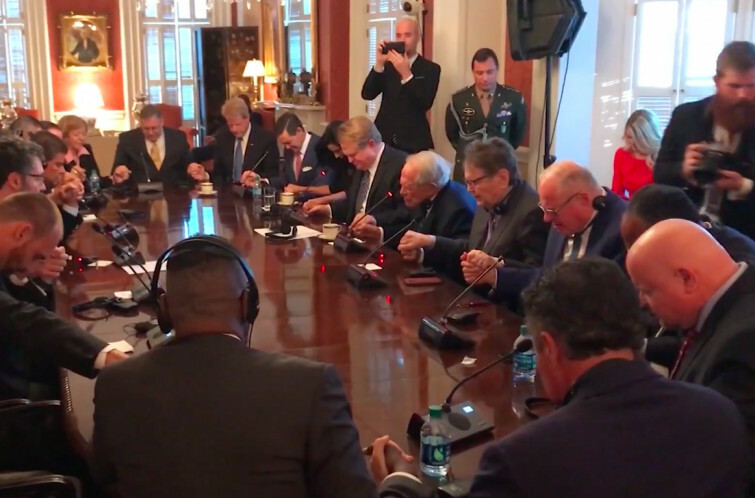 The group was made up of pastors, CEOS and community leaders, who prayed over Bolsonaro. Watch the video here. "Lord, uphold him. Protect him from evil. And, use him mightily in years to come"
"We pray, Lord, the anointing of the Holy Spirit come upon him (Bolsonaro)," prayed Christian Broadcasting Network Founder and Chairman Pat Robertson. "That he may have wisdom. That he will hear a voice in his ear when he turns to the right or to the left saying, 'This is the way. Walk ye in it,'" Robertson continued. "Lord, uphold him. Protect him from evil. And, use him mightily in years to come," he finished. Robertson called for joint cooperation between Brazil and CBN in order to tackle the humanitarian crisis in Venezuela. After this talk, the leaders also praised Bolsonaro for his outspoken Christian beliefs. "We all want blessings from God but the truth is that blessing needs the foundation of salvation," said Christ for All Nations evangelist Reinhard Bonnke. "If a country is covered in the gospel of Jesus Christ, what a foundation," Bonnke continued.